In depth discussions on hard drives, SSDs, RAID setups and network storage systems. 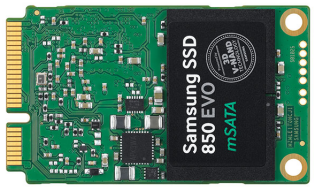 In addition to our review of Samsung's new 850 EVO M.2 SSD, CDRLabs has taken an in depth look at the 850 EVO mSATA. Designed for ultra-thin laptop PCs, this new addition to the 850 EVO family is available with up to 1TB of Samsung's 3-bit 3D V-NAND and, depending on the capacity, is powered by one of two different controllers. To compensate for the slow write speeds typically associated with 3-bit NAND, the 850 EVO mSATA is equipped with Samsung's TurboWrite write acceleration technology, which creates a high-performance write buffer in the SSD. The drive also offers support for Device Sleep (DEVSLP), hardware-based full disk encryption and Samsung's RAPID (Real-time Accelerated Processing of I/O Data) technology. By using free PC memory as a cache, RAPID can push the performance of the SSD beyond the limits of the current SATA specification. Samsung (finally) released version 4.6 of their Magician software so the review has been updated to include RAPID benchmarks.